Hank is literally at the end of his rope in his tenth adventure. 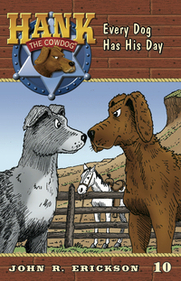 It’s roundup time at the ranch and Hank is left behind, tied to a post, while a high-bred border collie named Bennie takes his place. How can Hank restore himself as Head of Ranch Security and reclaim his fame and fortune?